Remember the awesome diving catch by the Shark a couple of weeks ago to rob Nyjer Morgan? How about last year's ridiculous backwards sprawling diving catch by the Shark? Of course you do. After all, this is why he is nicknamed the Shark. HE HUNTS DOWN FLY BALLS LIKE A SHARK GOING AFTER IT'S PREY. 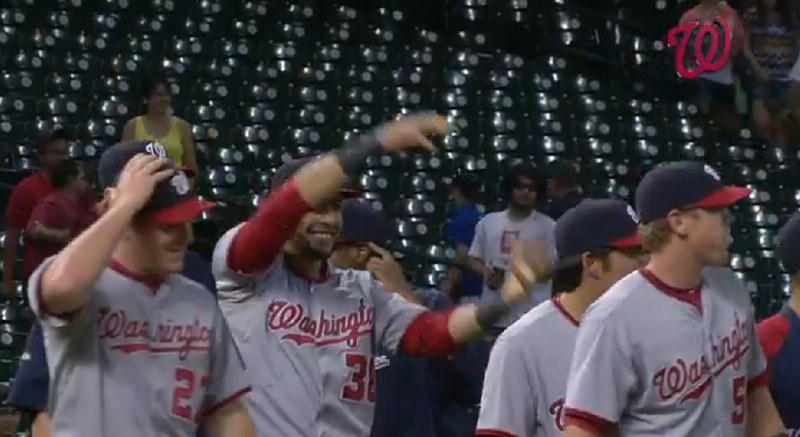 Dan Steinberg DC Sports Bog: The Nats react to Roger Bernadina’s game-ending catch- this has some awesome images of the players reactions to the catch! Also you can vote for it for Web Gem of the Year here. Currently it is winning 86% to 14% for Mike Trout's catch early this season. Just for kicks, watch the video of his spectacular catch from last year. If there is anyone out there that doesn't believe he's the Shark, speak now.